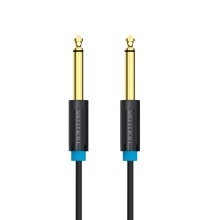 VENTION 6.5mm Male to Male Audio Cable enjoys HiFi sound quality. Gold-plated process and tinned copper ensure durable use and stable performance. It is ideal for stage performance. Professional Stage Audio Cable. 6.5mm cable can be use for many professional audio device. HiFi Audio Quality. Guitar connects sound equipment. Gold-plated Interface Process. Sensitive and stable connection hugely reduces sound quality loss. Widely Used For Stage Devices, including E-guitar, sound console, amplifier, speaker and microphone.